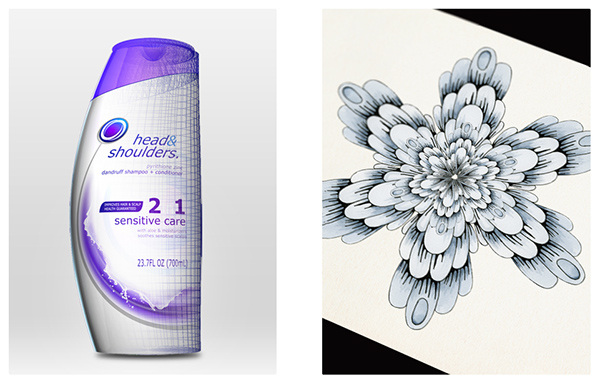 Artwork to promote the Head & Shoulders brand. We worked with a U.S. agency to create this piece which includes some nice pencil drawn elements, pen & ink drawing, watercolour, 3D modelled bottle and vector art. The deadline for this one was around two days, so a fast turnaround for this was important. Some of the elements of the image, a 3D model of the product and a hand drawn burst. Artwork to promote the Head & Shoulders brand. We worked with a U.S. agency to create this piece which includes some nice pencil drawn elements, pen & ink drawing, watercolour, 3D modelled bottle and vector art. The deadline for this one was around two days, so a fast turnaround for this was important.